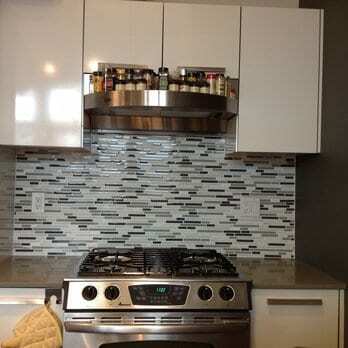 tile backsplash | Odd Job Handyman Services, Inc.
That headline should read “substantially” add value to your home. Because new tile in just the right place can substantially add new value to your old home. Home design and style goes through trends and updates more times than most people move houses, so its important to stay up-to-date when you finally do decide to sell. Some people spend a lot of time in the bathroom. So, why shouldn’t you feel comfortable in there? The bathroom is one of the places where potential buyers will look the closest. They want to make sure it’s clean, in-style, and definitely not off-putting. And let’s face it: your avocado-green sink and toilet ain’t a selling point. Also, the less said about that weird brown and orange tile scheme, the better. Retiling before you sell takes care of all that dirty, stained old grout you’ve been building up, and removes any mold that may be sneaking in from all that moisture. Clean, stylish bathrooms are a definite added value. Your kitchen can look like this too. Kitchens can have the same problems as bathrooms (dirty grout, mold, mildew). But kitchens also provide unique opportunities for tiling. Where your bathroom can accommodate tiling around the floor or bathtub, your kitchen as a magical, wondrous place called the back-splash. The back-splash is an area just behind your sink (or, the back) where water may — get this — splash. Some kitchens will only have drywall back here, and that’s bad news. Drywall can be easily water-damaged, and will harbor mold. The paint will also begin to discolor and peel. A tile back-splash, made of ceramic, clay, or glass tile, will prevent this. Tile is much easier to clean, and it looks great. 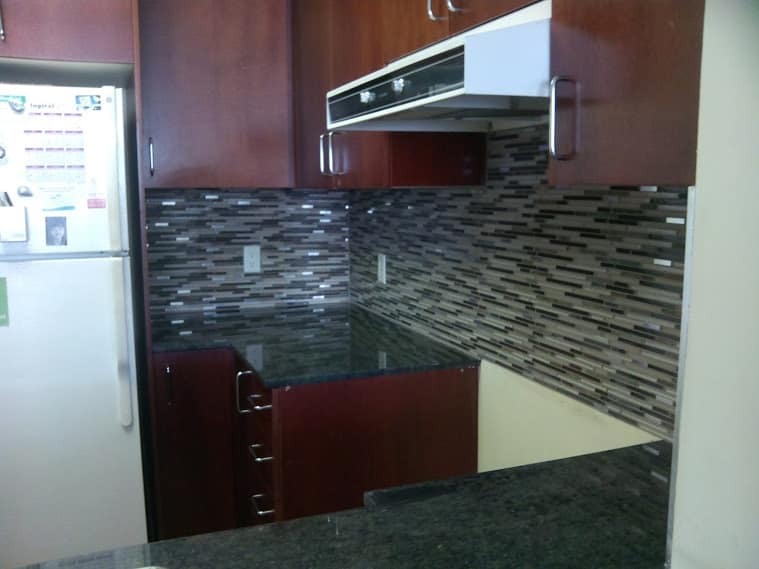 See what a new back-splash did for one of our previous clients, here. The sharp-eyed among you may have noticed that I didn’t say “retile” your ceiling. That’s because it’s pretty uncommon today to see a home that has tiling on the ceiling anywhere but in the bathroom, but hear me out. It’s a big, big trend among the hipper spots in Toronto to “upcycle” old tin tiles from old businesses and install them into new restaurants and vintage-inspired stores. And why not? Those old tin-tiles look great. You don’t even have to go antiquing to find them anymore. 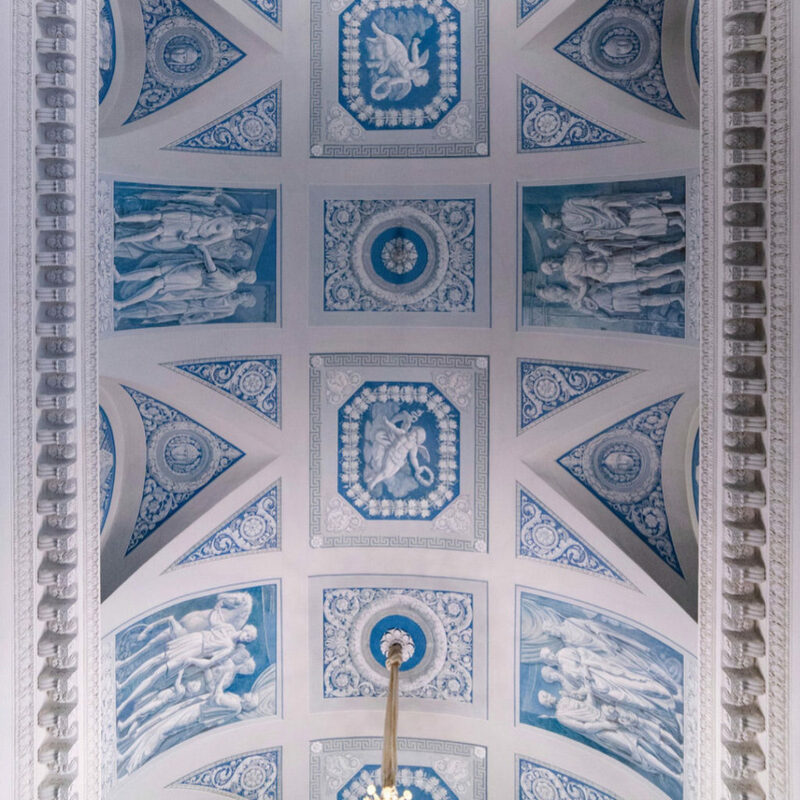 New tiles are being produced that mimic that old style, without the history or price tag. 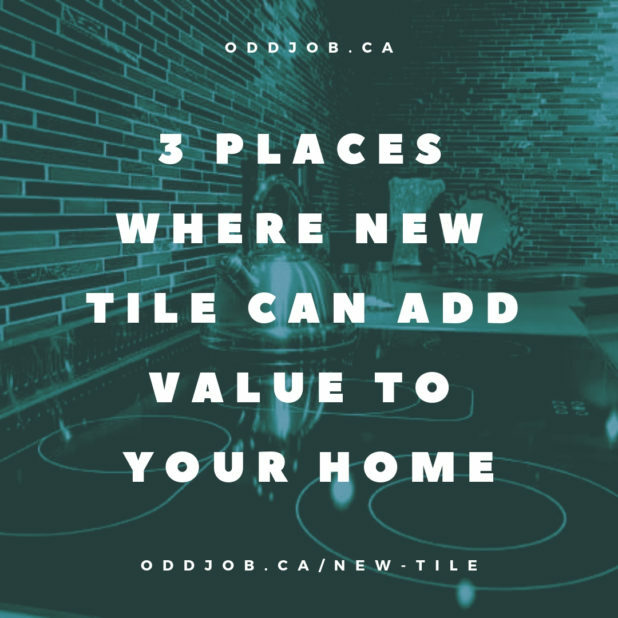 You’d be amazed how much more enjoyment — and value — you can get out of your home simply by sprucing up or adding a few tiles to a few choice areas. Ask Odd Job about some new tiles today. People won’t stop requesting tile backsplashes – and not just in their kitchens and bathrooms anymore. 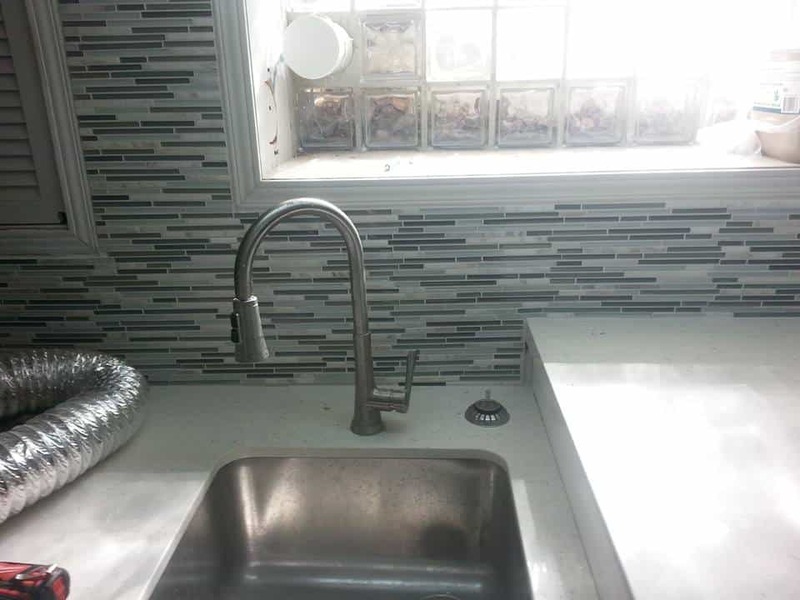 People want them covering entire walls: take a look at the results of a backsplash project that left client “Darren S.” loving Odd Job! We’ve probably installed more than a hundred of them since the birth of our company in 2008, and along the way we’ve learned a lot about just how important they are. Many homeowners have told us that the first compliments they receive from guests almost always regard how gorgeous their backsplash is. The possibilities for yours are virtually endless. There’s a reason why every classy restaurant from Subway to Starbucks has done everything but make them a part of their policy, and it’s because they are the very definition of eye candy! Your kitchen can look like this too. Book us today! (1) It protects your wall from water and accidents such as cooking splatters. Mishaps that would normally cause permanent damage to your wallpaper or to your painted walls suddenly become easily removable when they collide with the stark tile surface of your backsplash! 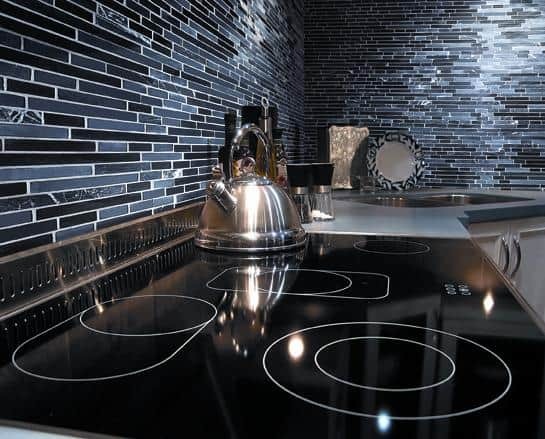 (2) Backsplashes are incredibly beautiful, and can truly enchant your space with an incredibly powerful mood – one of your choosing. The tiles you choose will determine the vibration of your room – whether you opt to go for traditional, modern or anything in between! A good tile backsplash makes an impression. 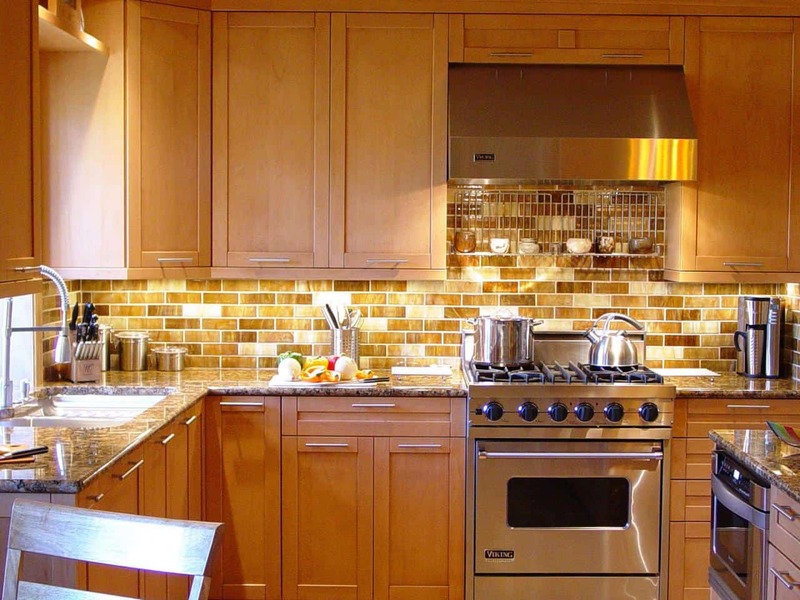 Why should you call Odd Job for your backsplash project? Because we know what we’re doing. In the last two years, we’ve successfully completed more no less than thirty of these projects. In every case, the clients were left extremely satisfied – and why not? One project was particularly memorable. 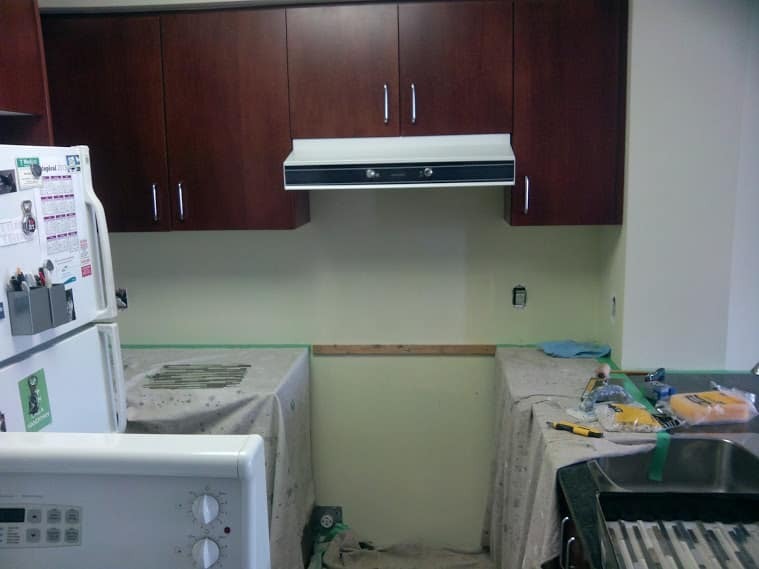 It was a breezy summer day when our office received a call from a young man who was quite unhappy with the appearance of his kitchen. Was anything broken or scratched? No. Stains? No. He wasn’t calling for repairs – he wanted an upgrade. “The walls are kind of, you know, blah,” said the male voice on the other end of the phone line. Alex and his mother Ruby had recently moved in to their pleasant little home. It was in good repair and they had not yet had to make the dreaded trip to Angie’s List or Homestars. They had always found the soullessly white walls of their new kitchen to be rather boring, however, and it was starting to get to them – particularly Ruby. We pointed out that the counters and cupboards were all dark in colour, and that a mosaic tile backsplash could work beautifully in the room. After showing them a few pictures not unlike those featured in this post, they were completely sold. “How soon can we do this?” asked an excited Ruby. The team arrived a week later with the tiles and the tools. After several visits, our team wrapped up the project and Alex and Ruby were now telling anyone who would listen about their beautiful backsplash – a mosaic composed of glass, granite and metal tiles. What do you think? 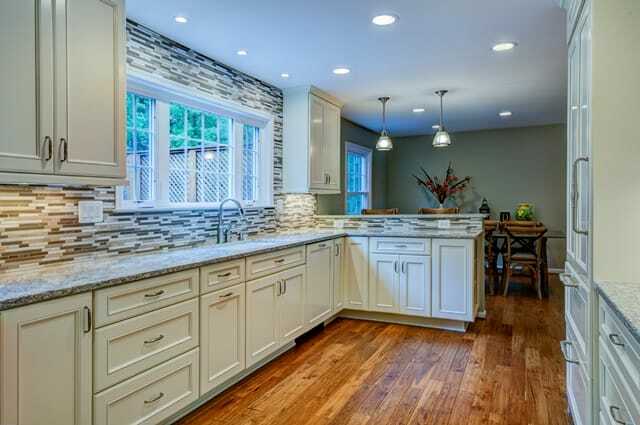 Notice how the tile backsplash jives perfectly with their countertops! The walls aren’t exactly “blah” now, are they? 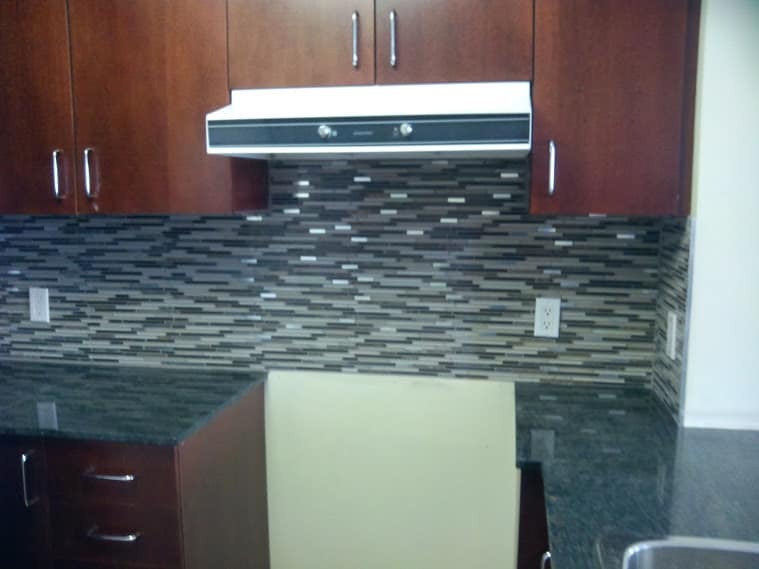 Another stunning backsplash, courtesy of your friends at Odd Job! The tile backsplash is one of those trends that never dies. It’s been ‘in’ for as long as anyone can remember, and there’s no sign that this will change. So if you like the work you’ve seen in this post and have an idea for your own backsplash, give us a call at (416) 520-1161 or just take a minute to fill out our online booking form. Bring your vision.. we’ll take care of the rest!